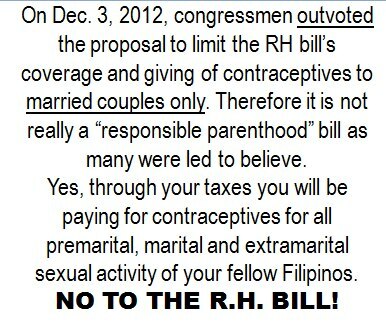 MANILA, Dec. 4, 2012—Based on the way legislators voted on proposed individual amendments on House Bill 4244 on Monday, many of the pro-RH solons have no qualms about enabling single men and women to benefit from taxpayer-funded contraceptives that the P3.7 billion measure seeks to provide to the public. In a line-by-line process of going through the measure which ended at around 10:00 pm, Cebu Representative Pablo Garcia proposed several individual amendments pertaining to the insertion of phrases pertaining to the sanctity of the family and the protection of the life of the mother and unborn from conception. However, it became clear that “responsible parenthood” was farthest from the minds of those who shot down the proposed amendment which would have included only married couples among the recipients of free birth control supplies and services. Pangasinan Representative Kimi Cojuangco and Gabriela Representative Luzviminda Ilagan were among those who voted “no” to the amendment, with the former citing the presence of unmarried couples living together as an indication of the proposed revision’s unsuitability. Ilagan regarded the proposed amendment as “discriminatory” towards unmarried people. “Now we can see that billions in taxpayers’ money will be used to give condoms and contraceptives to even high school kids. Wow, ang galing na ‘responsible parenthood’ bill ah!” said an observer after the six-hour session ended. The tackling of amendments will continue today, with the session expected to run for many hours again, due to the enthusiasm with which RH bill proponents have pushed toward passage of the measure.